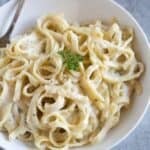 This Skinny Instant Pot Fettuccine Alfredo has all of the delicious rich and creamy flavor you love from traditional fettuccine alfredo but it’s lighter and much healthier, with no butter or heavy cream, and a fraction of the calories. 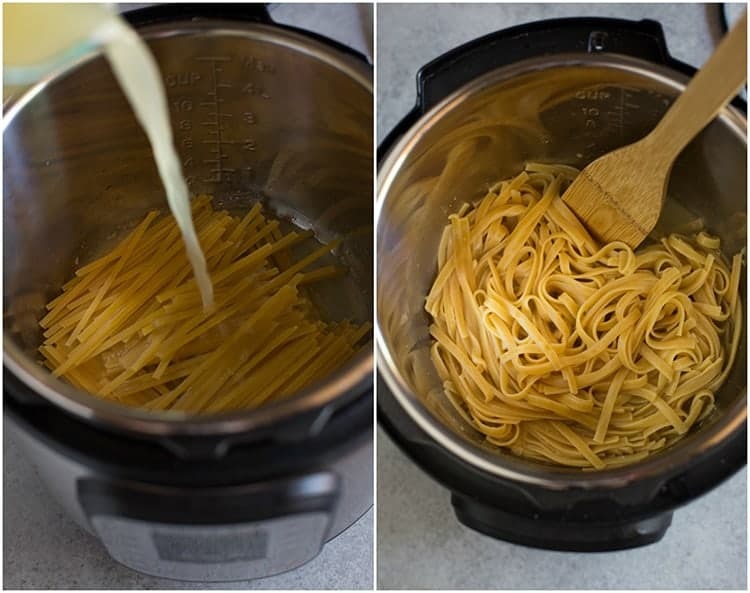 If that’s not exciting enough, it’s made in the Instant Pot for a super quick and easy pasta (and even easier cleanup) that your family will LOVE! 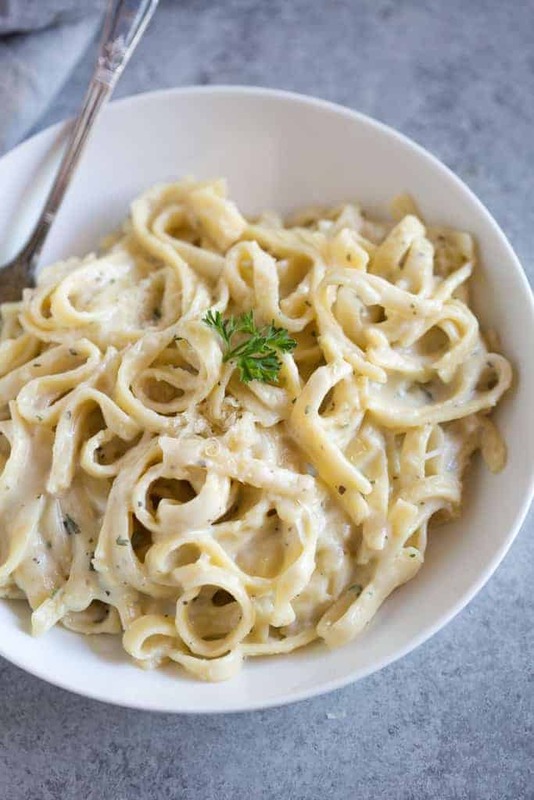 I don’t think there are many people who would turn down a cream, cheesy, delicious bowl of fettuccine alfredo, but there’s really something exciting about taking such a high-calorie comfort food and tweaking it to still taste amazing, but be WAY healthier! One big bowl of this healthier fettuccine alfredo pasta will barely cost you 400 calories. How’s that possible, you ask? It’s made with skim milk, instead of cream, and there’s not butter or cream cheese. The sauce also has chicken broth, few of my favorite spices, and fresh parmesan cheese, of course. It’s really flavorfully, and creamy, thanks to cornstarch as the thickening agent. I adapted this recipe for the instant pot from my favorite one-pan skinny chicken alfredo recipe. The love how the instant pot takes all of the prep work out of it! Start by sauteing the garlic in a little oil. Turn the Instant pot off and add the fettuccine noodles, broken in half so they fit into the instant pot. Pour chicken broth over the noodles, making sure they are covered in liquid before securing the lid. Cook the pasta on manual, high pressure for 3 minutes, with a 6 minute natural release. Open the instant pot lid and give the pasta stir, breaking up any pieces that have stuck together. Stir the cornstarch and milk together until smooth. Add it to the instant pot, along with the dried basil, parsley and onion powder. Stir it well and then and the freshly grated parmesan cheese. Add some salt and pepper and taste the sauce. Add additional seasonings if needed. Turn the instant pot back to saute and stir the pasta gently until the sauce begins to thicken. Keep in mind that the sauce will thicken significantly as it cools, so allow it to cool for a few minutes before serving. You can always add some additional cheese or a little more cornstarch slurry, if needed, to thicken the sauce. Want to add chicken to your fettuccine alfredo? No Problem! Cut 1-2 chicken breasts into thin pieces, or use chicken tenders, so that they will cook through at the same cook time as the pasta. Brown the chicken in a little oil at the beginning, on saute setting, then remove it to a plate. Then add the chicken on top of the pasta before closing the instant pot lid and cooking. You can use gluten free pasta in this dish, but be mindful that it cooks a little fast than regular pasta. Cook for 2-3 min high pressure with a few minutes natural release. Yes, you can double the recipe, and use the same cooking time. Don’t own an Instant Pot? No Problem! 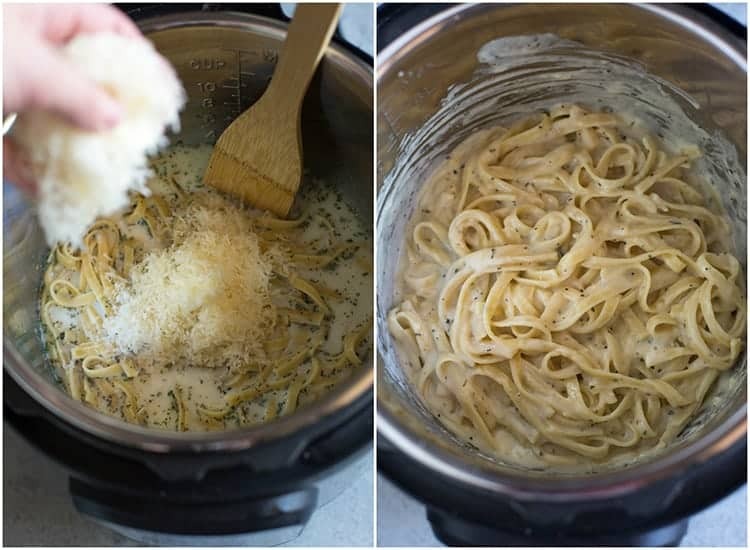 If you don’t own an instant pot yet, you can make this same fettuccine alfredo in the stovetop with this recipe. FOLLOW ME on FACEBOOK, INSTAGRAM and PINTEREST for more great recipes! 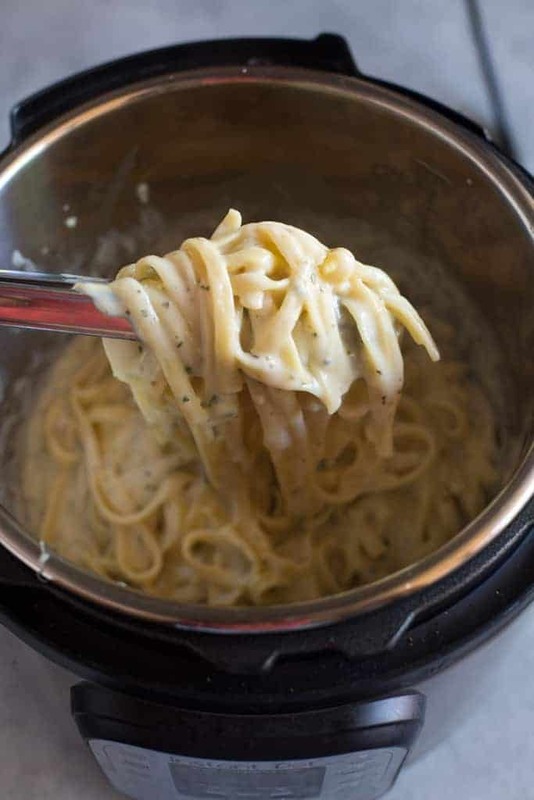 Skinny Instant Pot Fettuccine Alfredo is rich and creamy, with a fraction of the calories of traditional alfredo. It's an easy instant pot pasta recipe that everyone is sure to love! Add oil to the IP and turn to saute. Once hot add garlic and stir for 10 seconds. Turn IP off. Add pasta and chicken broth, making sure the noodles are covered in the liquid. Turn valve to sealed and cook on manual (high pressure) for 3 minutes. When the times beeps allow the pressure to naturally release for 6 minutes, before turning the valve to release remaining pressure and open the lid. Stir pasta, breaking up any pieces that have stuck together. Stir the cornstarch and milk together until smooth. Add to the instant pot, along with the dry spices and parmesan cheese. Season with salt and pepper, to taste. Turn Instant pot to saute setting and stir gently until the sauce just begins to thicken. Turn Instant Pot off. The sauce will thicken significantly as it cools, so allow it to cool for a few minutes before serving. You can add additional cheese, if needed, to thicken the sauce. Don't own an Instant Pot? Make this recipe in just one pan, on the stove-top, with this recipe. Didn’t really follow the recipe procedure. Did it stove top as we added Aldi’s special Seafood ravioli! Yum! The milk and corn starch really helped make it lo fat! Sauteed onions, mushroom, and small shrimp and added to the Ravioli! Next time, the IP!